Hail and Wind from severe thunderstorms can cause major damage to your roof and your home. Wind Damage to your shingles is fairly obvious to see unlike Hail damage. With wind damage, missing shingles or broken shingles are usually pretty obvious to see from the ground. They are usually seen along the eve or at the top near the ridge. Hail Damage on the other hand must be looked at from the Roof and even then it is not the easiest to see from an untrained eye. With Hail Damage, it is best to have a professional Roofing Contractor that specializes in Storm Damage Repair come out to your property to give you a Free property inspection. At Johnson Exteriors, we give ALL homeowners free inspections to determine if you have storm damage to your property or not. We will show you via pictures or video what Hail damage looks like to your shingles if you have it. We will also show you pictures of any damage that we found below the roof line from our walk around your property. Roof leaks are another common thing that happens from severe thunderstorms. This happens when high wind or straight line winds drive rain into sliver type openings that are virtually impossible to see with the human eye. These are more often than not somewhat of a simple fix. Give us a call, we can handle your Roof Leak Repair. The damage you may suffer will vary depending on a few important details, such as the direction, the speed and the duration of the wind. If the winds are coming in from the right angle and direction and are pounding your home and roof at a steady, continuous rate, you could very well have severe damage to your property and /or roof. Other reasons damages may occur is the shingle type, age of the roof shingles, and the kind materials used under the shingles. Not all contractors use top grade materials and certainly not all contractors use the best workmanship while trying to cut corners on projects. If the materials that are on your roof are brittle due to age and natural weather exposure, it is more likely to not withstand high winds that are powerful and at a constant rate. As mentioned above, the quality of the materials used, as well as the workmanship shown at the time of the installation can determine the strength of your roof during high winds. If the roof was installed properly with a high grade of materials, chances are better that only minor damage was sustained and you may only need a simple repair. However, if poor choices were made when choosing the materials and/or the contractor was careless in how it was installed, damage caused by winds will occur easily. If we determine that you do in fact have damage to your roof and property from the storm we will explain to you what the next steps are and walk you through the process. We have found that this is what homeowners love the most about working with Johnson Exteriors. They love the fact that we are experts in dealing with Insurance companies and know how to handle settling their Insurance claim. We know what your rights are and we make sure that your carrier does not take advantage of you. 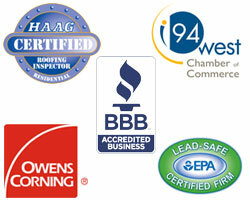 If you think you have storm damage, give Johnson Exteriors a call and let us give you a free property inspection. We will be happy to work with your insurance company if necessary in order to provide you with the supreme service the thousands of other customers of ours has received. If you need a Roofing Contractor in Saint Paul, we are here for you.